Your Thoughts and Perspective: Maybe it is posts in your social media feeds or texts that you have highlighted in an eBook or via social bookmarking. Networks You Are Link To: The obvious connections associated with a phone are through the contacts. However, further connections also come through various social media accounts we often have attached. Your Purchases: This could come in the form of an eBay and Amazon account or via receipts sent to your email. Where You Have Been: Whether it be via the various mapping and transport applications or via the meta-data attached to things such as photographs. Watters’ purpose is to highlight the potential of one device and what impact it might have on privacy and data when handed over to the wrong people or organisation. 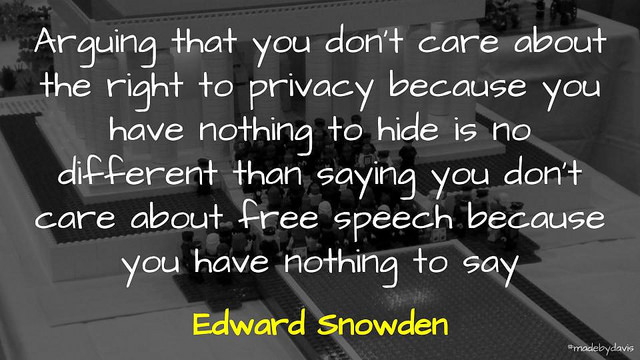 I wonder if we get lulled into thinking that we have nothing to hide? There are two issues with this. One that in an environment of identity pseudo-science you do not always know how data will be interpreted. This is something that Watters and Kin Lane discuss in some detail. The second concern is that we rarely remember or are aware of everything stored or captured in our phone. Clive Thompson captures this in his book Smarter Than You Think when he demonstrates that our memory cannot always be trusted. The other argument made is around phone security. The problem with thinking that your phone is secure is that, with so much data held in the cloud, you are only as secure as the network which you are connected with. With this in mind, Watters suggests thinking about security is actually about supporting the wider community and protecting those who may be vulnerable. For although you can protect your own devices, you often have little control over everyone else’s or which country decides to challenge questions around jurisdiction or change the law. In the end, it becomes about personal choice and control, reclaiming your web presence is a part of this. I may choose to be open, but that is in fact a privileged choice that I am able to make. Not everyone is in the same situation. For further ideas, Andy Greensberg shares some ideas about protecting your digital privacy, locking down your device and keeping passwords secret. While Doug Belshaw and Dai Barnes discuss the topic in Episode 75 of the TIDE Podcast. Watters also unpacks many of these ideas further in her presentation on EdTech in the Time of Trump. So what about you? What strategies do you use to manage your smart phone and mobile data? As always, comments welcome. It takes a village. Four Things Your Smart Phone Says About You by Aaron Davis is licensed under a Creative Commons Attribution-ShareAlike 4.0 International License. Curtains are multipurpose to increase indoor heat retention, increase sleep when early morning sunrise means its twilight or better practically all night esp up north, decoration ….